In the past, for instance, a good UX writer (probably not by title, but by skill) decided that when a user sends a newsletter with MailChimp, they’re probably in a state of minor anxiety. To make them feel better about what they’ve just sent, the MailChimp team designed a success message that lightened the mood and congratulated the user, rather than simply report a status. “I just sent an email out to 5,000 people oh god please don’t have any typos…oh! Thanks Freddy! 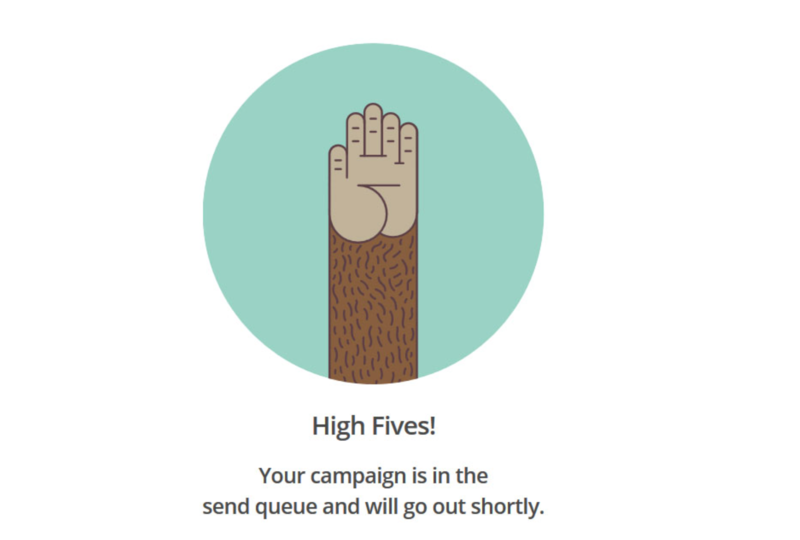 High five!” MailChimp’s success message takes into account the user’s emotional state after sending/queuing up a newsletter. After digging through a few dozen job descriptions for UX writer roles, there are definitely some common responsibilities. Unpack customer insights, and iterate on the content and the overall design to produce innovative products and features. You will write innovative, stunning, memorable and effective copy, combining creative inspiration with creative leadership to introduce new ideas and experiences to the world. Collaborate across teams with marketing, legal, and business development, in order to ensure copy doesn’t get anyone in trouble. Through all the job descriptions I’ve pored over, it seems like these other not-strictly-UX-writing responsibilities appear for a number of reasons. One reason might be that the organization can’t justify hiring someone who only writes interface copy, so instead looks for a cross-functional team member who can kill two birds with one stone, so to speak. Another reason might be a lack of understanding of the skillsets involved in writing vs. content strategy, writing vs. editorial savvy, etc. Either way, it clearly helps to be a cross-functional candidate. If you’re interested in actually reading a list of these descriptions, I’ve published a list of job descriptions over at my website. Go nuts! Here are a few sources for aspiring UX writers, not only to learn more about the practice, but also to evangelize to others. This technical writing guide, which while is technically, “technical writing,” is a fantastic resource for writers who have to be extremely particular about word choice. Harvard Business Review explains how a company is only as good as its writing. The Center for Plain Language stresses the importance of clearer language across disciplines, from law to medicine to web forms.